Now more than ever, the ball is in our court. Young voters account for half of the voting population, and their opinions and votes are finally rocking the nation. Recently, issues rising in politics are especially relating to concerns within millennials: equality, access to education, healthcare, and climate change. It’s time for the future to have their voice heard in government. The young voter turnout of the 2018 midterm election proved to be a step in the right direction. 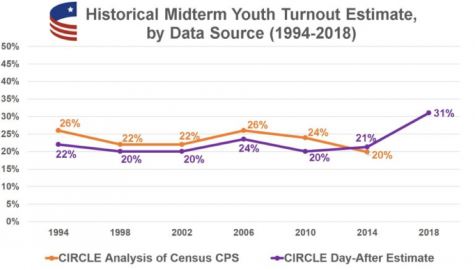 According to The Center for Information and Research on Civic Learning and Engagement (CIRCLE), 31% of the youth (ages 18-29) cast a ballot during this year’s midterm, a drastic increase from the 21% in the 2014 midterms. With this extreme rise in participation, the youth made a powerful impact on the results of the election. The CIRCLE reported that, “67% of youth voted for a House Democratic candidate and just 32% for a House Republican candidate,” creating a groundbreaking 35-point vote choice gap which almost certainly contributed to the Democratic Party gaining control of the House of Representatives. The spike in young voters shows their growing ambition; they need to continue to make a difference. As the baby boomer population decreases in size, millenials are projected to be the largest, most influential age group of voters. Every single one of their votes counts, and the young voters can use their demographic to sway elections. Not only does their large quantity make millennials important to our voting system, but they are also are one of the most diverse groups of voters; they are sure to bring fresh views to our government. Young citizens need to continue to make a difference because in the end, they will be the ones benefiting from an improved government. Millennials are usually hit hardest by issues surrounding college debt and lack of jobs, therefore, it is imperative that they go out and vote for representatives that will make a positive change. In order to know what representative would best embody their ideas, social media provides easy access to an abundant network of information regarding politics. Easier than ever before, the youth can continue to stay informed and opinionated about politics with resources at their fingertips. In order to uphold the founding principles of our democracy, it is essential that one of the largest and most influential demographics vote. It’s time for the future to have their voice heard! Get out and register to vote or sign up for an absentee ballot at FVAP.gov.